The Auspice of the Exalted One is one of the ten Auspicious Asterisms (as-su’ud). The Arabic term indicates good fortune or something that is auspicious, especially a star. The Auspicious Asterisms are all pairs of otherwise unremarkable stars, except for one that is comprised of four stars. The Arabic term al-bari’ indicates someone or something that is excelling or overtopping. 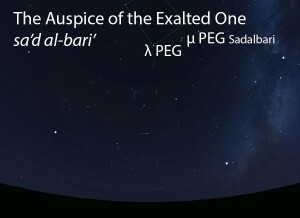 The Auspice of the Exalted One (sa’d al-bari’) as it appears in the west about 45 minutes before sunrise in early August. Sky simulations made with Stellarium. A pair of stars close to each other, of similar brightness. The Auspice of the Exalted One is not one of the lunar stations, but four of the other Auspicious Asterisms are: the Auspice of the Slaughterer (sa’d adh-dhabih), the Voracious Auspice (sa’d bul’), the Auspice of Auspices (sa’d as-su’ud) and the Auspice of Woolen Tents (sa’d akhbiya). 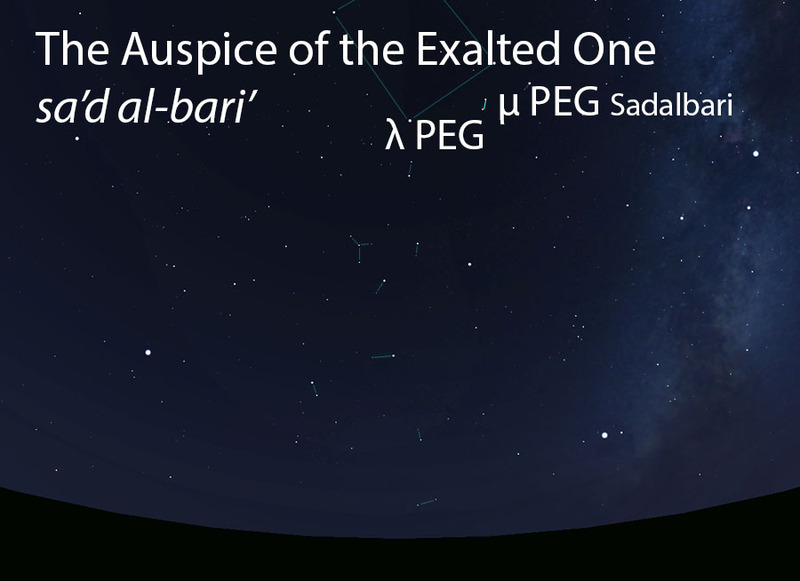 The Auspice of the Exalted One is part of the Auspicious Asterisms (as-su’ud, السعود) folkloric celestial complex.